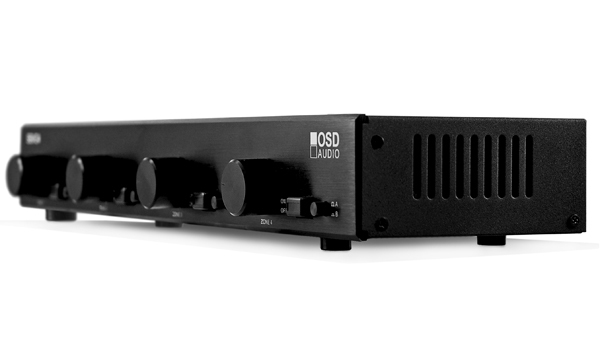 The SSVC4 is low-profile table top volume controls with individual A/B input selectors for each listening zone. The SVC300, a 300 watt autoformer volume control is utilized in each SSVC for uncompromised sound quality and performance. The screw down terminals to 14 gauge cable. The SSVC’s feature 16 gauge steel construction with our durable black wrinkle powder coating and gray silk-screening. Dual Zone output, choose between two music source for each zone. 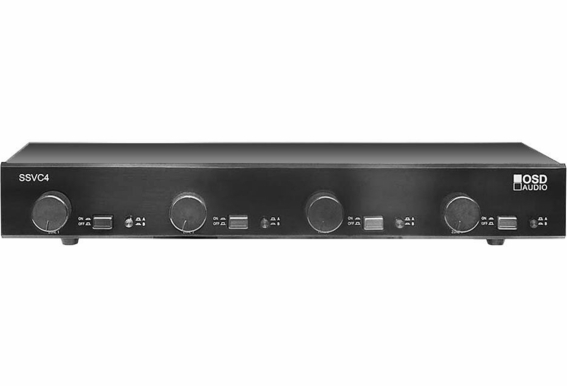 The SSVC4 is low-profile table top volume controls with individual A/B input selectors for each listening zone. The SVC300, a 300 watt autoformer volume control is utilized in each SSVC for uncompromised sound quality and performance. The spring-loaded guillotine-style push terminals accept up to 14 gauge cable. The SSVC’s feature 16 gauge steel construction with our durable black wrinkle powder coating and gray silk-screening. 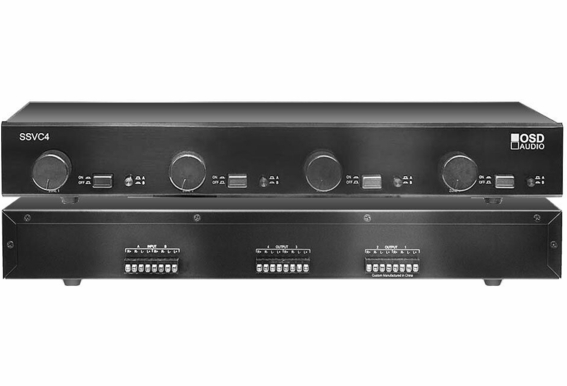 HI Dustin: The SSVC4 does not come with Rack mount ears whereas the Preamp has a faceplate where rack ears are integrated. I have [2 x 250W(RMS) @8 ohms] power amp and 4 pair of speakers [@8 ohms-50w RMS].All same model. SSVC4 model has impedance jumpers inside. Is it needed to change jumper into 'x1 or x2'? There manual read, ' These settings correspond to the number of speaker pairs you will be adding to each zone and should be adjusted accordingly. The default is 4X for each.' Is it good match with amp - ssvc4-speakers as I mentioned above? This is what I have: Living Room: - 4 built in speakers (2 front and 2 rear) - interior speaker wiring for all 4 speakers with speaker jacks on the wall where the tv resides --- also want to add a subwoofer for home theatre Outside: - 2 built in speakers - wired to living room with speaker jacks on the wall where the tv resides I do not have a receiver, and am trying to determine what to get. I'm now thinking that since I'll want the 5 indoor speakers OR the 2 outdoor speakers to be playing, this SSVC speaker selector would not work. What would the receiver requirements be? Does this mean the sound is mono and not stereo? And what if you have surround set up in one room ? This amp has a & b speaker switchâ€™s but both canâ€™t be played at the same time. I have another set of speakers in another room that I would like to have hooked up. Hello, Im currently doing a sound system install at a local restaurant and Im wondering if the attached photo of my planned setup will work. Ive been reading through the customer questions here and other sites and they have mentioned about using a amp/mixer so it will give audio sources the extra volume it needs rather than just plugging the audio sources straight into the SSVC4 Just wondering if the Mackie mixing board in the photo will work as to what im doing. Kind of curious as ive never used a zone/speaker selector like this before. Thanks! Hi, doing some research on the ssvc4 and an amp for whole home audio. I have 4 separate rooms, each with 1 speaker that I would like to run mono. I do not have an amp/receiver yet as this is my biggest concern, how do I get mono to 4 separate speakers in zones with centrally controlled volume. Here are the specs on my speakers: Audio Specifications Sensitivity(2.83V@1m) 89dB Frequency Response(-10dB) 32Hz â€“ 20kHz Nominal Impedance8 ohms Crossover Frequencies2.4kHz Recommended Maximum Amplifier Power100 watts Any recommendations would be appreciated! Something that is regular priced of $300 thatâ€™s now $88 causes me to question -why such a big discount? Is there a newer model that replaced it or something? I need to control 7 zones. Can I daisy chain two SSVC4 selectors in order to do that? Thanks! I would like to find a speaker selector to power combinations of 4 and 8 ohm speakers using my NAD 218 THX 200W amp. Two questions: 1) Will these selectors handle 4 ohm loads in combination with other speakers if the amplifier is rated to drive 4 ohm loads? 2) It seems that the OSD speaker selectors (and many others) accept 14awg wires or smaller, is there a way to get get larger wires into them? Thanks! 1.) NO, you should never mix impedance. 4 and 8 ohm should be run through separate amplifiers. 2.) Not at this time as there is no benefit when running through a speaker selector box. I want to use a sonos system - can I use this with the sonos amp? What does the unit connect to? With dual source, can 2 zones be on amplifier A, and the other 2 zones on amplifier B at the same time? Can this be used on a 70v system? Can you use 4 ohm speakers with this? if so, is there a special way of wiring them or same as normal? Does this switch support stereo speakers for each zone? If I wire zone 2 of my amplifier into the input will i be able to hook up 2 speakers in 4 different locations? Please let me know what I should set inner switches to for 6 ohm speakers. ALL of my speakers are 6 ohm. Upgrading to Marantz sr7010(has ohm selection for 4, 6, 8) with outlaw 5000 amp for full 7.2.4 atmos and will use ssvc for switching and activating outdoor and front room towers (back/listening room is all ELAC) for all channel stereo 11.2 (Oppo bdp-103d media player) I have read the reviews, q&a's, and manual and notice ya'll have great customer service and answer that question. But didn't see anything about 6 ohm. Looking VERY forward to testing! Haven't done an upgrade like this in years! Wallet keeps reminding me! Hi, I have two sets of speakers 4 and 8 ohms. My amp is rated 2 x 150 watts, is it ok to play both speakers at same time? I have a Rockville RPA6000USB - 1000w - 4 channel Amplifier - Is the SSVC4 the right choice to run my two pair of 8 ohm speakers? Hello, Not familiar with that amp, but this unit can only take 300w max per channel. I am interested in this product. The receiver I want to connect it to has an audio output that accepts a plug in. Do you sell a cable that has a plug in on one side, and open wire on the other to screw in to ssvc4? Or do I have to cut the connector off of one end and strip it back? Hi Mike, When you say a plug in, do you mean RCA? This unit is a passive device that needs to be run from an amplifier via speaker wire. I have a spare 7.1 receiver which has Spotify Connect and Airplay receiving-capabilities. I am considering using this in order to power onwall and in-ceiling speakers I have in the lounge (2 speakers), the bathroom (2 speakers), kitchen (2 speakers) and bedroom (1 speaker). I was going to buy a selector but I have experimented some with the 7 channel stereo which seems to send L/R to front, rear, side and center speaker (which gets l+r). Would an speaker selector such as the SSVC4 add something to my install? Also is it advisable to put speaker level volume controls between the receiver and speakers or will this disturb the receiver? Down the road I am aiming for a proper multi-room setup but I am waiting for a multi channel amp with spotify connect and airplay capabilities as well as good app control for controlling the zones (most of which my 7 ch receiver has except the individual volume control). Hi, At the heart of my home AV system I run a Denon AVR3802 receiver. It, however, can only source- and volume-control 2 independent zones/rooms, which does not meet my needs of wanting to control 4 independent outdoor listening areas in addition to my living room. I recently inherited a NuVo NV-E6DMS six source, six zone amplifier, however do not have or want to utilize the in-wall individual zone controller keypads this multi-zone amplifier typically is set up with. 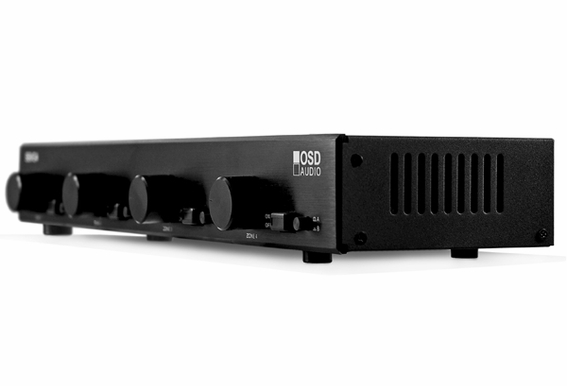 Is there such a thing as a centralized multi-zone volume controller that would allow me to feed a single source signal to the Novo amplifier and then have that NuVo amplifier send up to 6 zone audio signals to a centralized volume controller which, in turn, would take the individual audio signals, modulate them individually to the desired audio level (incl. "off") and then send the modulated signal to 8-ohm speakers in the various outdoor listening zones I have? Thanks! I have a Yamaha RX-V663 - 7-channel Receiver. I currently use the iPod Dock with Polk Audio RTiA7 8ohm speakers in the front speakers A port in my house. I would like to hook up 1 - 3 sets of Yamaha AW390 speakers (6ohm) on my covered porch either at the same time (A&B) or just A or B by themselves. First of all from what I am reading in the receiver manual is that if i want to run ports A & B front speakers at the same time I will have to have all 8ohm speakers and can only run 1 additional pair. Can i use this speaker selector for what I want to do? I have a Yamaha RX-V390, and I wish to drive sound into two rooms - room One has a single set of speakers and room Two has two sets. Primarily, I want to achieve different volume levels in room One versus Two. I am confused by the wording of the RX-V390 manual...it describes front/center/rear capabilities rather than speakers A vs. B. Anyway, is the SSVC4 the right product to pair with this RX-V390 to achieve what I want? I am looking at a Onkyo TX-NR616 with 7.1. I would like to drive the SSVC4 from the multi zone 2 speaker outlet to 4 pairs of 8ohm speakers. One in the pool area, one on the front porch and 2 pairs in the kitchen/dining room. Not all 4 will be on at the same time, likely 2 maybe 3 sets at once. What would I set the impedance to inside? What size of receiver could I get away with? I have 3 sets of outdoor speakers that I want to connect. Do I need the 7.2 still, or can I get away with a smaller receiver? My receiver has 2 channels. If I want to use the Speaker Selector to control 3 pair of speakers, what is the best way to connect the receiver and selector? Does the input/output connectors accept banana plugs? I have an Onkyo NR609 running a 5.1 surround indoors. I am adding 2 pairs of Bose outdoor speakers outside and a pair of your word rock speakers in a landscape area. I have also purchased your 200 Amp, the DSM 4, and this SSVC4. Could you let me know where to connect to my Onkyo using Zone 2, I presume to the Amp 200, etc,etc.....I believe I have everything needed? I have a game room as my primary sound hub and now I would like to install speakers around the house . I would like to use the receiver that runs the "sound hub" but I would still like to use the sub. How can I still make the sub part of the system. I guess if the receiver is its own zone then it will work, but not sure if the receiver is totally isolated now with a SS. So this system could actually be a 5 zone system with a 4 zone SS?? How do you change the jumpers on the SSVC4 unit? I am curious about using this with my Denon Avr 2313. I'd like to switch different speakers for different sound modes, and may want to double some of them. I.e. If I want two wide speakers and four rear speakers or vice versa. I was just curious if this is healthy for my amp switching around the two surround zones among the 6 speakers I have mounted for back, and doubling the surround channels into two speaker sets. My speakers are all Jbl satellites rated at 100 watts and my receiver is rated at 105 per discreet channel. And please tell me about "jumpers" that I have read about from other questions here and how it will effect my set-up. I have 3 pairs of 8-ohm speakers and one pair of 4-ohm speakers. Will the SSVC4 properly match the different impedance and protect my source amplifiers? I read another post that indicated there are "internal jumpers" that are set at 2x. Would I have to take apart the speaker selector in order to change jumpers? If so, how would I set them so my system is properly balanced? I don't quite understand what comes out of the receiver and from where to go into this. Is it out of the receivers native speakers outputs? I have a Yamaha RX-V2095 AV receiver. I want to add additional speakers, e.g. outdoor speakers, bedroom etc. I am thinking of using the SSVC 4 to control the speakers and volume. I did this before just using one of the speaker output and dividing, I do not think that is best option. There are ways to connect an external amplifier and then a speaker selector. What are the best options here? I am considering the SSVC4 for my set up and want to make sure it will work. I have a 2-zone Onkyo receiver and on zone 2 I have 2 sets of outdoor speakers (in parallel), each with a OVC300 volume control located outside by the speakers. This setup works great. I have great sound from each set of speakers. I now want to connect the zone 2 to a SSVC4, separate each of the outside speaker sets into a separate zone on the SSVC and also connect to 1 of the 2 remaining zones to a set of speakers in another inside room. All speakers are 8 ohm. I would like to keep the outside volume controls. Will this set up work? Can I have the outside volume controls after the SSVC4? Should I keep the volume control at the SSVC4 on max and control the outside speakers' volume with the OVC300? The only set of speakers that I really need the volume control for is the third zone that will power the additional room. If I have only the zone for that room turned on the SSVC4 (the 2 outside zones are turned off), is it passing all the power from the receiver to that room only? Is there a switch on the SSVC4 that adjusts the impedance, just like on the OVC300? what should it be set to? Thanks! If I supply this device with 100 W and run 4 pairs of speakers from it the max. power to each pair will be 25W? Or is 'impedance matching' allowing 100W to each pair.? If I want the remote speakers to be louder than the signal from the main reciever, can I put a secondary stereo amplifier on the line into the ssvc4 and, if so, do you have a recommendation for such an amplifier? How do you remove the speaker connector plugs? The instruction page refers to a "captive screw" on each side of the connector. I'm not finding that. Connection options to be sure I understand. My receiver has an A/B selector. Please confirm that I can connect this unit to my B speakers coming out of the receiver as 14 gauge speaker wire. 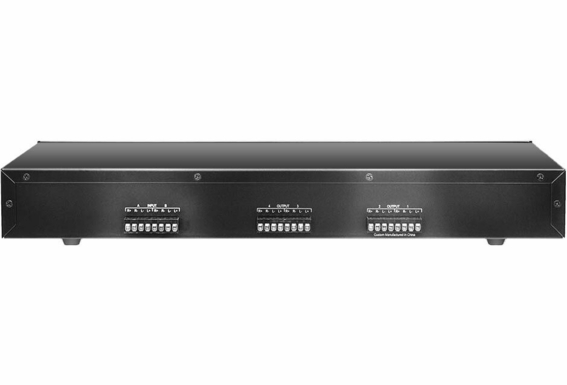 The SSVC4 can split this signal into 2 or 4 zones with separate volume controls. If that sounds correct. Given this set up, will I be able to turn my amp volume down (my A speakers) and still crank up my B speakers much louder? Thanks for your help! Can this unit handle 4 ohm speakers? I have 2 pair 8 ohm and one 4 ohm. i have an home theater receiver, what is the best way to connect to this device? front, rear or center outputs? I am considering a sound system with 3 separate pairs of outdoor speakers around my pool. I am also looking at a dual coil sub-woofer for the pool area. Wouls the SSVC-4 Speaker Selector be a good choice for me? Can I use one of the "zones" to control the volume of my sub-woofer? The name of the unit says 300W, but the user guide indicates 100W per channel! Which is correct? Can I connect it to a 170W/per channel receiver?